Spying on spies: an illuminating inquiry into little-visited corners of spookdom. Debut author and Yale Law student Keefe points to a pattern suddenly well known to those who listen in on what the rest of the world is saying: “Before September 11, before the Bali bombing in October 2002, before the suicide bombs in Riyadh in November 2003, there was a sudden spike in chatter, a crescendo of foreign voices. Then silence.” The good denizens of the Sigint (signal intelligence) demimonde thus pick up on supposed code words and relay warnings about the “chatter” to the proper authorities, who then spring into action. Or, as often happens, Sigint fails to relay warnings to the proper authorities, who are caught unawares. Keefe offers what he allows is a conspiracy theory involving hidden intelligence agencies coordinated by the principal English-speaking powers, most of whom are not supposed to spy on their own citizens; there’s nothing in the books about spying on each other’s citizens, however, and so the secret police, in a supernetwork called Echelon, keep tabs on the world, eavesdropping on signals plucked from the air at no-longer-secret bases in Yorkshire, the South Atlantic, the middle of Australia, and even closer to home (Keefe quotes intelligence-community expert James Bamford as saying that the reason the US likes to sponsor economic and trade conferences on home turf is “because it makes it easier for the eavesdropper to listen in”). 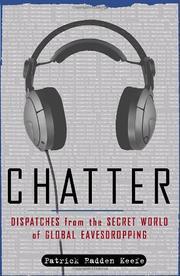 The question, of course, is what to do with all that data; for all its purported usefulness, Sigint was a signal failure in September 2001, and the members of al Qaeda, Keefe writes, appear to know that spies are listening in and are now in the habit of feeding misinformation into the system, adding chatter to the chatter. Far from definitive; as Keefe admits, “Having finished my investigation, I realized that I had not filled in that void so much as circled it.” Still, an effective and welcome start.